Some of you may remember last year when we welcomed Italian rider Francesca Selva into our league whilst she was here studying. Well last week SCRL broadened it’s international horizons even further by hosting Australian national J17 (youth) Gold and Bronze medallist Eliza Bennett. Eliza, representing her home club Bathurst CC from Bathurst NSW, raced with the Youth A boys in the mixed A/B races, and recorded points in all races, with wins in the handicap and the three lap dash. 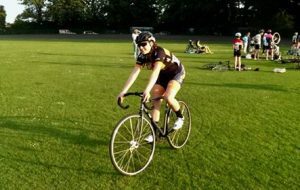 Whilst on a family holiday to visit her sister studying in the area, Eliza was missing racing and so a quick search turned up SCRL’s Wednesday league. Just wanted to pass on my thanks again for your clubs generosity in allowing Eliza to race and for taking the time to chat with us. Eliza had a ball and had plenty to talk about in the car on the way home. The boys were good sports and should be proud of their racing and we wish them every success. I also want to pass on our very best to your club. I really hope that one day we can return the favour to members of your club if they ever find themselves in Australia near Bathurst and looking for a race or just a pedaling companion. So if you ever find yourself near Bathurst, NSW and miss your Wednesday nights, you know who to call!